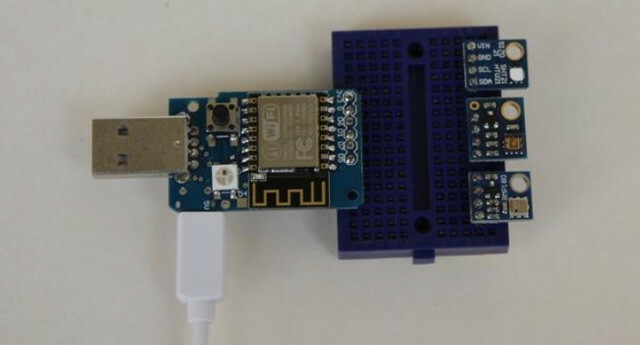 Last month, I wrote about WiThumb a USB WiFi adapter based on ESP8266 processor which can conveniently be plugged into any USB port for power and programming. However, the hardware design was questionable with the WiFi PCB antenna placed close to other components, and a temperature sensor likely to get pretty hot inside the case. There’s now another device based on a similar concept with vESPrino USB stick that also expose a few I/Os through its enclosure. The board has been designed with Cadsoft Eagle, and the schematics and PCB layout file have already been released. There are also various add-on boards made for the board including light sensors, temperature/humidity/pressure sensors, gesture sensors, OLED or LCD displays, as well as a relay module, micro servo, and PIR sensor. There are currently two enclosure available the small one as show in the first picture, and a bigger one to allow one or two add-ons modules. While the board could likely support any ESP8266 firmware, the developer also developed vESPrino open source firmware (no code yet) that can configure ESP8266 over the serial port, setup a WiFi connection, upload data over HTTP or MQTT, and support online services such as IFTTT, Dweet.io, Thingspeak, Ubidots, as well as OTA firmware update. A Chrome-based app will also be provided to find vESPrino and configure it visually. The short video below does a good job at showing the board and add-ons capabilities, and the web configuration interface. The project has launched on Indiegogo aiming to raise at 3,000 Euros, but since the developer has selected flexible funding he’ll get the fund whatever amount is collected. You’ll need to pledge at least 6 Euros (+ 3 Euros shipping) to get vESPrino board with a small enclosure. You can also order various combination of vESPrino and add-on boards selecting various “credits” rewards using the perk calculator. Delivery is scheduled for September 2016. Not interesting , There is already a similar and better board (NodeMcu).